An 'American Style' absinthe created in Brooklyn NY. Appearance: A very pleasing peridot. Seems to be colored well. Louche: none to be found. I guess there's a slight haze, but that's about it. Aroma: Odd. It doesn't really smell like absinthe at all. There's a hint of wormwood and some other herbs, but it doesn't smell like absinthe. Slightly minty with a bit of citrus and what seems like a hint of cinnamon. Flavor: Strikingly bitter. I'm not sure if they distilled the wormwood or if they also used it in the coloration. I enjoy bitter drinks, but absinthe should not be bitter like this. Very medicinal. Finish: acrid wormwood with underlying mint tones. 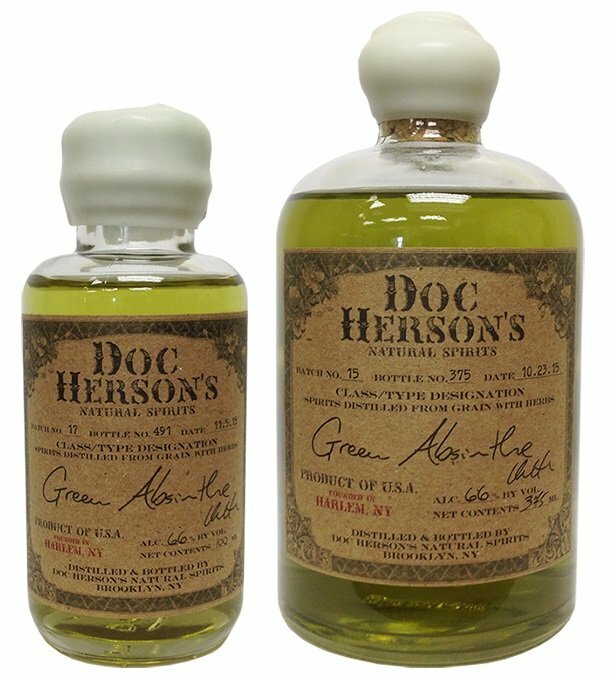 Overall: While the Doc Herson's people might take great pride in crafting their spirits, they are misguided in their attempts to make a 'low-anise absinthe'. If they truly are intending to make a high-quality absinthe, they need to add more anise and fennel to not only allow for a louche, but also to help fortify the typical absinthe flavor. I sincerely hope they are, as they obviously have the skills to produce something good if they wanted to. But for now, as it is, this is not representative of absinthe at all, and should not be used in cocktails as an absinthe either. Disappointed. I understand a distiller's desire to create something unique to differentiate themselves from other brands. But you can do that while still retaining the very basic characteristics of the category. I wonder if, during their research, they came across the fake stuff from Eastern Europe and fell for the marketing hype instead of researching historically accurate absinthe? I like that it's light on the anise flavor, even if it's unusual. I think most absinthes have too much anise/fennel etc. Smooth inoffensive (slightly medical? eugenol? (I know, spelling)) flavor. My main issue with it is that it's overly stimulating. Not relaxing at all. I had to pop a xanax to calm down. Won't purchase again.